The first issue of the Blackfoot Register also described “a ditch being dug from the Blackfoot River that would irrigate several thousand acres.” It was their plan to bring the water into town so residents could grow gardens and plant trees. The goal was finally realized in 1886 when Alfred Moyes planted the first shade trees in the Upper Snake River Valley around the Blackfoot Courthouse. 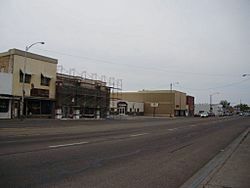 Others in town followed suit and within a few years Blackfoot’s tree-lined streets had a reputation that earned the nickname “Grove City.” Sightseeing excursions from the surrounding area were reportedly organized so they could “feast their eyes on this verdure,” which stood in pleasant, stark contrast with the endless acres of dry, gray sagebrush. Blackfoot is located at (43.190068, -112.346037). 31.2% of the population were under the age of 18, 10.9% from 18 to 24, 25.5% from 25 to 44, 18.9% from 45 to 64, and 13.4% who were 65 years of age or older. The median age was 31 years. For every 100 females there were 96.5 males. For every 100 females age 18 and over, there were 91.3 males. Blackfoot, Idaho Facts for Kids. Kiddle Encyclopedia.